A few days ago Cara Ellison wrote a wonderful piece about Tomb Raider and the difference between the earlier and later games in the series. My experience with Tomb Raider as a kid was limited to buying it in a bargain bin and having a hell of a time trying to get it to run on Windows 98. My mother tried to help me, reformatting some drives and installing mods that purportedly made the game run properly (although I’m positive that one of them just made Lara naked, much to my mother’s frustration). Ellison starts her piece by pointing out an often-forgotten (or at least rarely-discussed) fact about the first Tomb Raider game: Lara Croft is vulnerable. Few AAA games today let the player feel vulnerable in the way that Tomb Raider allowed. The environments were vast, cavernous, mysterious. Unsettling. Lara’s body was spindly, looked gymnastic yet somehow frail. Her bare skin was showing. The ambient sound was sinister, echoing, quietly insidious. The environments felt somehow claustrophobic and vast at the same time. But what was more important to my young eyes was Lara’s frailty. She looked thin and incapable, those narrow gun-toting wrists like stems of a flower. Climbing seemed a labour. She stumbled on things, bumped into things with a dramatic ‘oof!’ Every animation blend glitch evidence to me that she was panicking, breaking. She was at the mercy of her environment. The fact that she had few supplies, little clothing, and nobody to help her: these made her task even more daunting. The second paragraph of Ellison’s piece is about Tomb Raider as it fits into the general design trends of the time period when it was released. She remarks that the first game was “full of tension” and “had more in common with Resident Evil and survival horror than it does with Uncharted.” Formally, this comparison is unbelievably on point. Lara Croft’s jumps have a feel to them that have never been fully captured by a game since; they’re unbelievably graceful. Flipping through the air frontward, backward, and sideways, she moves around a primitive polygonal world. At the same time, she controls like a tank, her body plodding forward or leaping backward at the smallest push of the D pad. This body, always in excess of itself and moving more than you want it to, has an entire control scheme dedicated to limiting how much it can get in its own way: a button to look around, a button to walk instead of run. I played through the first stage. A temple, maybe, or something stranger in the Himalayas. The game is cagey about how much it tells you, but that lack of information is important as Lara makes her way into the darkness. The draw distance is short; the path in front of you is always dark. There are paw prints leading to and from that darkness, the remnants of the wolves who attacked Lara and her (now dead) guide in the opening cinematic. Lara chases or tracks them. I can’t really tell. The jump button requires priming. You have to hold it down a half a second before you want to jump, just a small amount so Lara can bend at the knee and launch herself a full eight feet in the air. 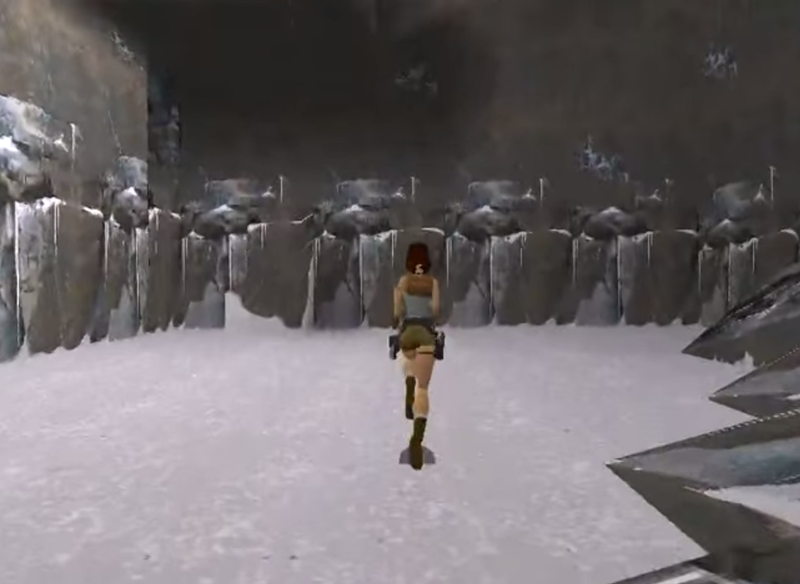 To leap between platforms, Lara has to patiently turn or sidestep to get into position. To grab onto a ledge she has to stretch her body forward in space; to grab it from below she hangs like dead weight until she decides to climb, performing an unbelievable pullup. I’m not writing all of this to make some kind of response to Ellison, but rather to go one step further in thinking about what I’ve been calling “deliberate action” in games. I’ve played The Last of Us: Remastered recently for review, and because of that I’ve spent a lot of time in the (wonderful) multiplayer mode trying to understand why I love it so much. A big part of my enjoyment there is how deliberate everything the player does feels. When I craft an item, it takes time; when I throw that item, the character heaves it. The animation takes time, and during that time I am vulnerable. Part of this has to do with limiting arbitrary risk. You cannot be shot five times in a row with nothing lost other than some health bars. Every encounter has to feel like it might be your last. TLOU‘s multiplayer does this by only allowing a player to be shot a couple times before death; Tomb Raider does it through sound design and enemy AI pathing. We know that Lara can kill the wolves, but when the wolves run around in a circle, lunge at Lara, box her into a corner at any time, it doesn’t feel that way. Lara’s vulnerability (and the vulnerability of the nameless TLOU multiplayer characters) comes not only from the abilities they have access to in the levels they live within, but also from the microchoices we make. Can we pause here for just a moment? If I run at this gap in the floor and leap, leaning into it as much as I can, will I make it? The choice I make could destroy me, but I do it anyway. I make a deliberate choice. I fly through the air. This entry was posted in Video Games and tagged cara ellison, the last of us, tomb raider, videogames. Bookmark the permalink. Running jump, grab the ledge, handstand to finish. Few games today have that tactile sense of calculation and movement that the original Tomb Raiders had. I do think there is maybe a sign that this sensory detail in movement is coming back. I appreciated the weight to Snake’s movement in MGS: Ground Zeroes. Also the new wave of horror games, Outlast, PT and the little I played of Alien: Isolation seem to bring a heft to each footstep. Just need to do it with platforming. Somewhere out there, there’s an awesome mountaineering game to be made. No ninjas or guns, just your character, the elements and a massive mountain to climb.